I mentioned something almost a month ago about rare movie and TV appearances by various classic movie stars, and one of them was Cyd Charisse, and that got me thinking about a movie I had last seen years ago with her that I can't remember. I think she appeared in only one scene in this movie and that's it. This scene in particular MIGHT have been at the beginning of the film. 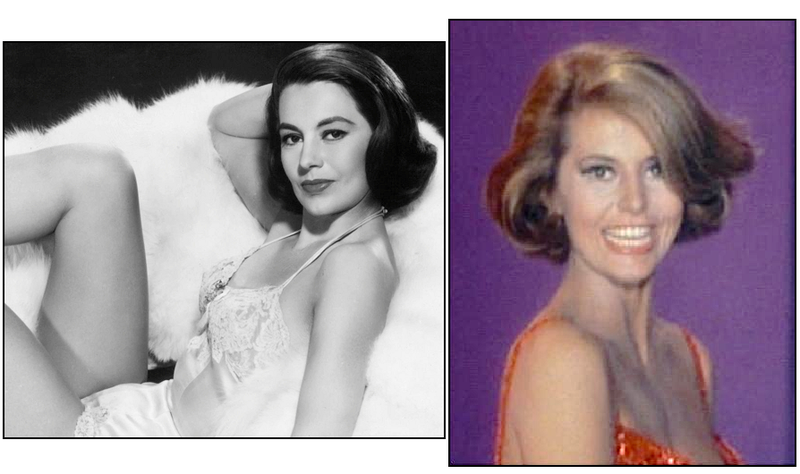 I'm also not quite sure if the woman was even Cyd Charisse, but based off memory I kind of get the feeling it was. All I remember was that this woman had short dark blondish hair, was wearing a red dress, and was dancing and also singing (it seemed as though her voice was dubbed over based off her mouth movements). I'm also guessing this movie was from the mid 1960s, because it seemed like one based off the style of music during this scene. This movie could have possibly been one of those contemporary "counter-culture" movies where someone like Cyd herself had really no place in it, except for one small scene where she's required to dance. I think you're remembering Cyd's striptease that accompanied the opening credits of the 1966 Dean Martin "Matt Helm" movie "The Silencers." She still had it. YES! That's the movie! I think I knew that Cyd appeared some other time midway through that movie, but I didn't realize it was also during the opening credits. I must have missed it back in September when Dean Martin was SOTM (I'm not a big fan of those "Matt Helm﻿" films myself). Gosh, Cyd sure doesn't look THAT much like the same girl we see dancing ballet so gracefully in the 1940s and 1950s MGM musicals - but it's still her! I do understand that by 1966, she's older by this time (only mid 40s) than she was in those "golden-age" movies, and her hair is a bit lighter and styled differently (she has so many different hairstyles), but just compare her in that opening scene in THE SILENCERS to how she looks about a decade or so preceding that film in MEET ME IN LAS VEGAS or even SILK STOCKINGS - it's almost hard to believe it's the SAME woman. Nevertheless, she's still VERY, VERY attractive! Funny thing, I had considered whether there were still any movies I recalled from long ago that I couldn't identify, but I couldn't think of one (after having eliminated several, one after the other, over time). But the specific query of this thread did remind me of something: Does anyone here recall that several years ago, TCM would occasionally run an untitled musical short film between features, one that I haven't seen since? This was in beautiful technicolor from the late forties or early fifties, looking like an MGM production, set in a dark interior well-furnished loft with a nighttime backdrop seen through the patio window, with about six or eight tuxedo-dressed male actors doing a song and dance in tribute to the one (silent) woman they were all serenading. I didn't recognize the actress, but two of the serenading men were only recognizable for their non-musical careers that would follow for decades later: Richard Anderson ("The Six Million Dollar Man") and Steve Forrest ("S.W.A.T."). Does anyone else remember this, and if so, would you know if this thing did have a title, and did you recognize anyone else from it? I'm pretty sure it's not listed on either Anderson or Forrest's imdb credits currently. On the other hand, if the film really doesn't have a title but instead has a number, since some of the old short films like the Vitaphone Pictorial Revues had numbers in place of titles, perhaps if another TV action star, Patrick McGoohan, were in the short, he might complain "We are not a number. We are a film." Gosh, Cyd sure doesn't look THAT much like the same girl we see dancing ballet so gracefully in the 1940s and 1950s MGM musicals - but it's still her! PS: I saw Tension last night on MOVIES-TV Sunday Night Noir; If you want to see Cyd in an early non-musical role this one is it. I saw that film last night, too (of course after seeing TCM's 25th anniversary). It wasn't the first time I've seen it, but I only tuned into it just to see Cyd. I believe Cyd had appeared in other non-musical roles (I can't remember off hand), but it's always kind of neat to see her focus on acting. In that opening film sequence from 1966, it seems as though this was Cyd's chance to try and take on a new and slightly edgier approach with dancing in a way that seemed fit for the times - not much like anything previously seen in her classic "golden age" era movies. After Tension Cyd was in a few more non-musical roles; The best of these East Side, West Side, also made in 1949, and is a romantic crime drama with Barbara Stanwyck, Van Heflin, James Mason, and Ava Gardner. Cyd as a good part in this film. Cyd did two westerns in 1951 playing an Indian women and a Hispanic one. While she did do a few other non-musical, but since The Band Wagon was such a hit she became known for musicals. I believe that one Western you're referring to is THE WILD NORTH with Stewart Grange﻿r, which will be on TCM by the end of this month. Cyd does have very beautiful facial features which have allowed her to play ethnic roles in some movies. Two other examples that comes to mind are FIESTA and THE KISSING BANDIT, both with Ricardo Montalban, where she plays a Mexican woman. I have seen that "all-star noir" (as I like to call it), E﻿AST SIDE, WEST SIDE, and I thought that Cyd was good in it, as well. I would really like to hear Eddie Muller give commentary on THAT film if it were to show up on TCM's Noir Alley someday. He would have his hands full with all of the big names featured. With all of this talk about Cyd Charisse in "non-musical" roles, I believe she was in some film from the late 60's called MAROC 7, that I really don't know much about. I wonder if that was EVER on TCM. Maybe someday if she were to become Star of the Month. Without question at all, THE BAND WAGON has got to be her MOST famous picture EVER. Incidentally, isn't Cyd's red dress that she wears in the noir scene in THE BAND WAGON, the same one she wears during the opening sequence of THE SILENCERS? That would be quite funny if it is. Compare her in those two different scenes and, as I had stated before, she just looks like two separate women.